Note: This game was formerly listed as Ace of Spades. However, the game was bought by Jagex and is no longer free. More information about the paid version, which has very different gameplay than described here, can be found here. This post is about the community-supported game now known as Build And Shoot, which is based on Ace of Spades v0.75, the last free version. This post has been appropriately edited to refer to the new name. Build and Shoot has been described as "Minecraft with guns." While not entirely accurately from a gameplay perspective, that should give you the general idea. Like in Minecraft, the world is made of blocks. You can destroy these blocks, or you can create new ones to build structures. Unlike in Minecraft, you also have with you a rifle, machine gun, or shotgun, and a handful of grenades. Also unlike in Minecraft, there is an opposing team of players trying to kill you and steal your team's "Intel"--this game's "flag" in its CTF mode. 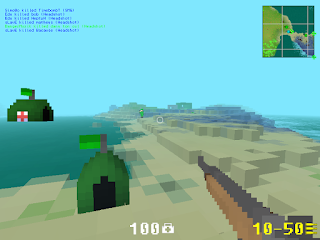 The game also features some other game modes, including "Territorial Control" (think Control Points from Team Fortress 2), and of course Deathmatch. And if you're looking to play online, the game has an active community, so you'll be able to find severs and players easily. I've played this game a bit now, and I have to say, it's fun. However, don't expect it to play like "Minecraft"; There's a reason I said "Minecraft with guns" wasn't entirely accurate. In Minecraft, you spend a lot of time building complex and beautiful structures. But in Build and Shoot, your opponents simply won't let you. If you try to build anything too extravagant, you'll probably be shot before it's finished. Or worse--someone could cut the foundation of your new fort out from under you and destroy the whole thing. Instead, this game plays more like World War I. Instead of huge elaborate bases, you'll be building bunkers, walls, or sniper nests. And you'll be digging trenches and tunnels. These quick and effective structures are important, and need to be strategically placed so you can infiltrate the enemy's side of the map without getting picked off. Because of its building and digging capability, Build and Shoot is quite different from other FPS games. Instead of running around blasting everything, you need to focus more on stealth--not being seen and not being heard. To get to the enemy's base, you'll need to think carefully about where to place your structures and tunnels. There could be a sniper hiding on the side of that mountain; or maybe he's over near those trees. Setting up for LAN play is a bit difficult. The game includes a "server.exe" to host, but it doesn't give you many options. As such, you may want to download the mod server PySnip. Also, to connect, players will need to use a special server browser, such as Spadille. More details here. Build and Shoot is still a Beta version, so you may encounter a few bugs every now and then. Also, it's lacking some of the polish you'd expect from a finished game. However, it's very fun to play, and overall Build and Shoot is an excellent free LAN game. Give it a try! I love AoS, its tiny (Under 10MB), works on even old computers and doesn't need a fast internet connection. This game is really simple and interesting for more games. Were do I download it? Version 0.75 is the one you're looking for. You can use the website's server browser or download Spadille to find people to play with. There's no prompt for payment. Hey thanks for your nice review. We now have a launcher that makes it easy to configure and play multiple versions of the classic game. Check it out in the "downloads" menu at BuildAndShoot.com. I like your site, I'll be back!